An ORCHESTRA is a large instrumental ensemble that contains sections of string, brass, woodwind, and percussion instruments. Other instruments such as the piano and celesta may sometimes be grouped into a fifth section such as a keyboard section or may stand alone, as may the concert harp and electric and electronic instruments. The term orchestra derives from Greek, the name for the area in front of an ancient Greek stage reserved for the Greek chorus. The orchestra grew by accretion throughout the 18th and 19th centuries, but changed very little in composition during the course of the 20th century. A smaller-sized orchestra for this time period (of about fifty musicians or fewer) is called a chamber orchestra. A full-size orchestra (about 100 musicians) may sometimes be called a "symphony orchestra" or "philharmonic orchestra"; these modifiers do not necessarily indicate any strict difference in either the instrumental constitution or role of the orchestra, but can be useful to distinguish different ensembles based in the same city (for instance, the London Symphony Orchestra and the London Philharmonic Orchestra). A symphony orchestra will usually have over eighty musicians on its roster, in some cases over a hundred, but the actual number of musicians employed in a particular performance may vary according to the work being played and the size of the venue. A leading chamber orchestra might employ as many as fifty musicians; some are much smaller than that. Orchestras can also be found in schools. The term concert orchestra may sometimes be used (e.g., BBC Concert Orchestra; RTÉ Concert Orchestra)—no distinction is made on size of orchestra by use of this term, although their use is generally distinguished as for live concert. As such they are commonly chamber orchestras. Battle of the Bands: At 175, New York and Vienna Face Off - The New York Times. Big Five (orchestras) - Wikipedia. LIST OF SYMPHONY ORCHESTRAS - Wikipedia. The World's Greatest Orchestras - gramophone.co.uk. 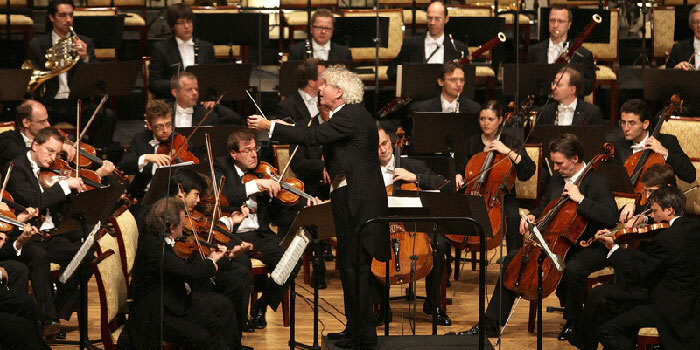 World's 20 Best Symphony Orchestras - ThoughtCo. Academy of St Martin in the Fields - chamber ensemble created in 1967. BERLIN PHILHARMONIC | BERLINER PHILHARMONIKER - founded in 1882. BOSTON SYMPHONY ORCHESTRA - founded in 1881. CHICAGO SYMPHONY ORCHESTRA | CSO - founded in 1891. Cleveland Orchestra - founded in 1918. Gulbenkian Orchestra - founded in 1962. LONDON PHILHARMONIC ORCHESTRA - founded in 1932. LOS ANGELES PHILARMONIC - founded in 1919. Monte-Carlo Philharmonic Orchestra - founded in 1856. NEW YORK PHILHARMONIC - founded in 1842. QATAR PHILHARMONIC ORCHESTRA - founded in 2007. Royal Concertgebouw Orchestra - founded in 1888. SAN FRANCISCO SYMPHONY - founded in 1911. The Philadelphia Orchestra - founded in 1900. VIENNA PHILHARMONIC | WIENER PHILHARMONIKER - founded in 1842.